Wilson designed the 85 for Jimmy Connors in the first place! Pete Sampras plays with a Babalot racquet the last time I saw him play. Also Jordan played baseball, so Chicago Bulls should forget about him, as he's not playing ball anymore. I do give you the Connors part, even though "Pete Sampras, who used the racquet for his entire professional career, established the reputation of the Pro Staff 85 (graphite/Kevlar) as a legendary racquet more than any other player" (wikipedia). Federer is the least person to have its legacy. Connors, Edberg, even Mary Pierce would be better than RF. It does look a bit like Tesla-Edison... let's go with Edison because he has charisma and is a celebrity. Tesla is a nut job, who couldn't land a contract, nobody likes him. Right? Unlikely as he never used that frame. Thanks. 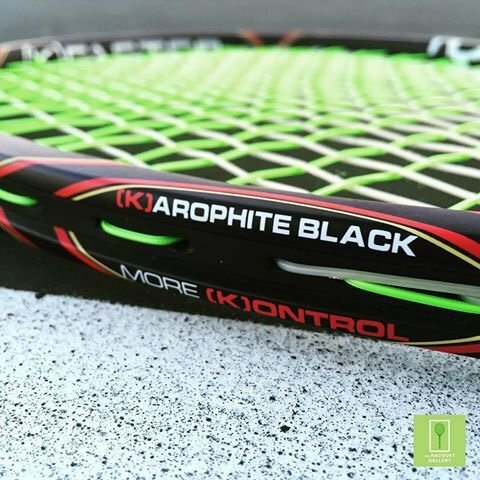 One of the better paintjob imo [K-Factor] with the Roger Federer signature. Indeed the Karophite Black Orange and Yellow KPS RF was an amazing frame. Only had one left in storage. The legend of the RF 88 will live on in the minds of those that still wield it forth. The Flex League battles this stick carried me through at Frushing Meadows were epic. Same here, the disrespect is real. If some one open a shop to change the icon to Pete, I think the lucky one can make a fortune out of this. Now see, that makes sense, a lot of sense. But you aren't speaking Wilson's corporate language, it won't happen. Really. Think they should list all atp pro inside the y beam to make this racquet more value on historical view. But I guess it would cost Wilson a lot to put each name up. By that time, we would be too old to wave. I gave two St. V. PS85 to my children in hope they will truely reflect areas they need to work on. But the coach innocently complain they are too heavy. This is nonsense when we were young and use Wood racquets at PE. Honestly I don't believe people would care about this pass our generation. I had picked up a handful PS85 from **** where the original source is estate auction. I hope you get the picture. We are old, some are very old. Some are too old to wave. I am still hanging there but the days are not too far away. K88 is still my favorite because it trains my forarm very well. Some PS85 especially the bumperless ones are more heavier and headlight than k88 and make serve more exciting. I will give a try of this new PS85 and see how it goes. But believe me, our time is over once Fed retire. The entire game rule is about change. Using the old PS85 is like using alumin standard sized racquet now. Has anyone played the RF85, yet? Please provide some info. Is it just like the original PS85? I'm thinking about getting two. I was told the rf85 feels closer to the TW replica but with better paint. This domake sense since the manufacturing tech should be closer to the modern TW replica than the original. Of close, there may be slightly difference since it's a different batch and the material may be different. However, it will not come closer to the original PS85. It was never the focus of the remake. It was made for rf, not for the good old time hence Pete. Wilson is really stupid. The company will hardly cover its fix cost to make these rf85. It is doom to fail with rf logo. If Wilson is smart, the company should remake st. V. PS85 grommets. I bet it will sell a lot more and make judge profit than the racquet. I am not living in states and do not have the luxury to demo one. But I look at my ps collection, I am sure even a Chicago PS85 should out run the new one. Except one thing, the new one has more life spend and its brand new. It means it will last longer than the old one. Mime had already show some hairline crack. It's not avoidable. Hence, buying the limited edition for the raining day is a clear solution. One may not like it, but it will be the only choice years after. Thanks, John, for your comments. Anyone else played with the RF85 AND St. Vincent/Chicago to compare? The RF85 really does not make sense. It's just a paint job of the reissue and nothing like the original Chicago or St. Vincent versions. Even though it may play well, the feel and the balance of the St. Vincent/Chicago frames are unmatched, and I would rather look for the originals. Haven't played with the RF85, it's braided graphite only though, with no Kevlar it will probably be very different to all previous versions. I feel like the magic that was in the PS85 will be missing in the RF85, like what happened to Head racquets when Twaron disappeared. Nope. No change in layup. But, from TW picture, in the hoop it says Braided Graphite 80% / Kevlar 20%. Peter, thanks for the confirmation. Moreover, the specs are just as similar to the TW-reviewed PS85 of August 1999, except for the RF85 is 9 pts HL (PS85 8 pts), and RF85 357.2 g. (PS85 357 g.). Same SW and stiffness. Underneath the paint it should be the exact same racket as the recent TW release. If it's the same as the recent release, that means it would be more flexy and lighter than the Original 85. I should think that TW and/or Wilson really need to confirm the truth about the RF85's specs before speculations go all over the place. I'm still wondering why it's not a PS85... as in Pete Sampras. Or is it that the RF here actually stands for "Racquet Fantastique"? LOL. TW shows strung specs which can vary a bit depending on string used, and other factors. I'm not trying to stir the pot for the sake of it, I was on the Tennis Only (Australian partner of Tennis Warehouse) website looking at the listed specs of the RF85 and under composition they just list "braided graphite". Maybe someone made a mistake in copying and pasting? Even Pete ditched this racquet. It's time to move on. Well, I'm not Pete. So what? Why should I 'move on'? I'm playing to stay in shape and not competing. I play to enjoy MY tennis. And been playing for 40 years. So, please, don't lecture me on what racket to use or not to use. It makes tennis so fun though. Got 2 and they're staying no matter what. lol, I was just joking. I'd get one if it were on clearance or something. So, you got the RF85? How does it play? Is it like, or very close to, the Original 85? I always remember the PS85 as Edberg's racquet. Even though made fore Connors. All the early advertising was Edberg, Sampras didn't really become it's sales icon until his 2 or 3 Major. Anyway doesn't matter who's on the advertising what's important is its price, which is far to high for re-issue that will not suit many players. Pricing is terrible, the RF97 is same and previous paint cheaper and it is much more suited for current era. There are exceptions of course. They're probably better off in Angell, Donnay and Pacific market. One marketing approach would be to sell it as the PS85 but provide decals for Roger, Pete, Stefan, your favorite PS85 player. It would be really cool if they could do the laser etching at the point of distribution but I think that would be pretty tough to do. Stick on Holographic images of you favourite player? I hope this is a big failure for humanities sake, it's $US249 for an old mold requiring no advertising. I though the re-issue was $US129 off memory or the last of the batch was. Could be wrong, but this is not for those who want to play or have long term memory. Wilson might do better releasing Stefan's SE97 2015. Can remember if it was much different to a RF97 but I find the RF97 much easier to use than a PS85, especially in today's poly dominated game. Might have had a bigger market than a RF85. I don't collect Memorabilia so mu view are probably out of touch. My hitting partner brought out the new 85 tonight. I hit with it for a few minutes and was impressed very nice racket I'm used to an 11.2 ounce racket and it did not feel much heavier even though it's at least an ounce heavier. I could really hit good spin with it even though most would not think an 85 would be good for spin. The racket feels like they somehow muffled out all the vibration, it had a nice feel but no harshness in anyway, and my friend strings full poly in the 60's but racket still felt very comfy. 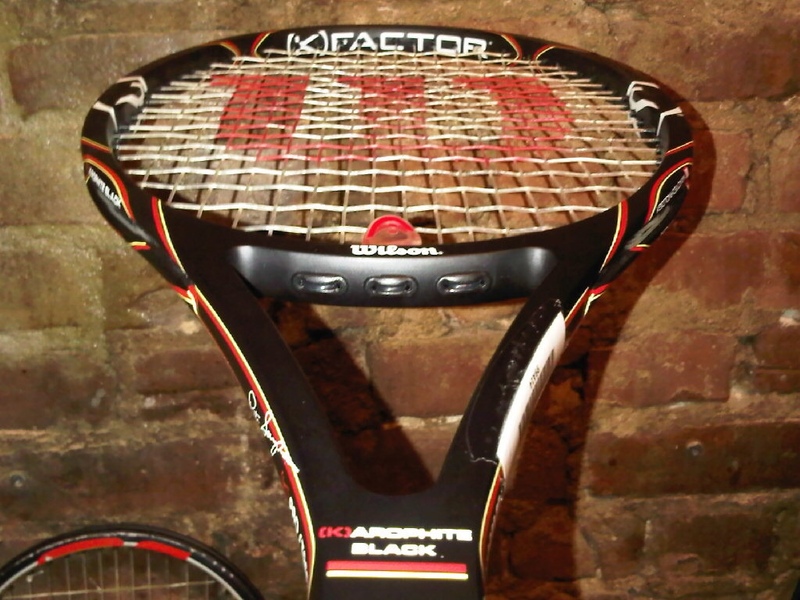 I think a lot of people will be surprised how well this racket plays with an 85" head size. You have any experience playing with the 90 and can you make any comparisons? What about comparing with other Pro Staffs? I played with an Asian version 90 a few years back. My buddy has been trying to make the RF97 work for over a year and switched to the 85 and I can see an improvement already. To me and him the RF97 is to cumbersome and it lugs through the hitting zone. It's great if your right on the money but a little off and the ball flys, to me this 85 is much better. 90 and 85 very similar or is 85 really worth trying? Right. Same with me, bro. If you made a transition from a larger headsize to 90 and loved it, then you should definitely give the 85 a go. It arguably takes the benefit of the 90 (plush feel, control, maneuverability) one step further, but you also get the downside of needing the consistency to hit the smaller sweetspot. Yes, I also consider this racquet as a Mr. Tennis Gentleman's one. Very similar I couldn't tell that it was slightly smaller than a 90.
sweetspot on ps85sv seem to be a little higher up than the 90, unsure if anyone else have felt the same? Maybe that's why the k90 didn't quite work for me initially. 2 massively unequivocally totally different frames. Price Diablo Mid is my current choice of racket. What's the name of this pro? And whether he is holding an oversize, midplus or a mid? Just for the hell of it I played with my PS 85 (Taiwan version) the other night and was surprised how well I played with it. My ball had less pop than my RF but I had less errors and volleyed better. Still the best control stick out there imo. I would give the edge to my RF overall but not as much difference as I would have thought. To me, the 90 played like the smaller headed Pro Staff 95, whereas the 85 had a unique playing characteristics that surpassed the playability of both the 90 & 95. I really couldn't tell the smaller head and played better with the 85 than both the 90 & 95. I think the Pro Staff 90 is a bit over-rated. It's still a great frame, but I think the 85 is much better all-around Stick. That's awesome to hear, maybe I will get one in the future but for now gotta wait for price to drop of these new ones. I have just place an order for the RF85 with TW. Once I get it (next Sunday, carried half the world over by a friend) I will find time to compare it with a closest-matched SV85 using Gosen OG-Sheep Micro 17 (or 16) at 50 lbs. Why OG-Sheep and not some better set up? Simple: it's only to get the feel and to experiment.